This absurd and extreme guilt by association that Heartland is pushing should be countered by making it abundantly just clear how absolutely absurd it really is. And while we are at it why not make people laugh a little. 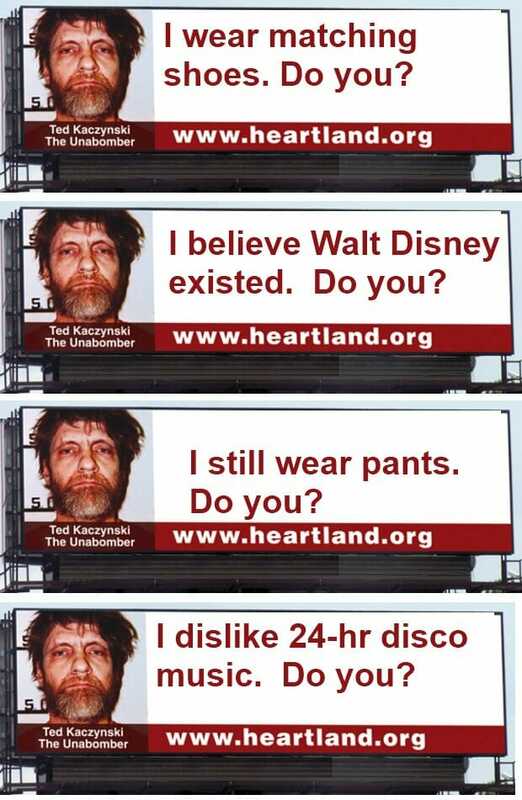 UPDATE: Let the meme begin: Nine out of 10 psychos agree: Heartland’s bonkers climate billboards need company! This absurd and extreme guilt by association that Heartland is pushing should be countered by making it abundantly just clear how absolutely absurd it really is. Verily, this stuff doth write itself. There’s really not much need for a response. If anything, billboard campaigns such as Heartland’s show one thing clearly: one should perish any hope that the US can ever show “leadership” in climate action in the near future. Isn’t it time it was explained to the American public that it is the Heartland Institute who are siding with the terrorists. By focussing the USA’s attention on a handful of terrorists, most of whom are now dead, the focus has been taken off the major threat to the US people and its prosperity – global warming. Note it is GLOBAL warming, and it will affect the US just as much as the rest of the globe. The people of Bangladesh will be in trouble from rising sea levels but so will the folks in Florida. Hurricane Katrina, the fires in California and the drought in Texas are only the start. Can’t people that it is not just the Twin Towers that will be destroyed in New York if sea level rises by up to 20 feet. Oh come on. Admit it, you liked them. After all, Hansen promotes blowing up dams. The 10:10 thing was stupid for the same reason HI’s billboard was stupid, but the motivation was not the same – it was satirical rather than earnest: it satirized what “denialists” think about “warmists”. Since most of the public has no idea about that, it just came out disgusting. So despite the comparably idiotic mistake, it was not a comparably revealing mistake. Indeed, the HI billboard confirms exactly what the 10:10 video was lamely satirizing, doesn’t it? That there is a completely insane (divorced from actual reality) attribution of the motivations of climate concern at the heart of the opposition? All you need is to have one good friend who is a warmist – even your gullible, aged Ma in a nursing home – to understand that the Heartland ads were insulting. The campaign was emotional, not intellectual. You understand it from the amygdala, not the neocortext (I got those words from Big Bang Theory). Heartland has opened a rich satiric vein, and deserves to bleed out. Why is the last one different? She probably did more damage and caused far more deaths than any of the others , with the exception of Hitler. Her opening of the Met Office Hadley Centre in 1988 coincides the beginning of the corruption of climate science. Her motive was not to “save the planet” but shift the country away from it’s dependence on coal and hence undermine the power of miners’ union. This has been public stated by her Chancellor (finance minister) Leon Britten. In fact, if H.I. were a bit smarter they would have used your last effort, it’s very much to the point. Those billboards were a FAIL. No excuses. Not quite as bad as blowing up children to blood and guts (10:10) but still pretty naff. A straight question. Did this blog condemn 10:10 in the same way as it condemns Heartland? Planet3.0 did not exist at the time. But I think it was a very dumb video. Rubbish! 10:10 was a call to violence pure and simple…. You just look stupid trying to defend it….. I was very interested in this page until I read your idiotic comment Mr Tobis…. Grow up! There are idiots on both sides of the debate and now you have exposed yourself as one of them. You had made a perfectly valid point that guilt by association is not science and has no place in this debate and then you expose yourself as nothing more than a cheerleader for a violent cause… Because the violence supports your belief…. Shame shame shame…. I didn’t defend it. It was distasteful and stupid. I hated it from the first instant I saw what it was. I just didn’t choose to willfully misunderstand it. I’m absolutely confident that no threat was intended. Your response shows how very broken our communication channels are. I am deeply sorry about that. PS – (My old blog is archived at this site.) Here is what I said when I first saw it.